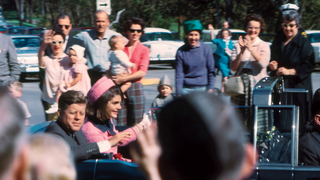 After sitting forgotten in storage for more than 45 years, the daughter of an amateur photographer has uncovered a set of remarkable images taken mere minutes before President John Kennedy was assassinated in Dallas. The photos, which now appear in TIME and LightBox, were taken by H. Warner King, a Dallas Jewelry wholesaler and amateur photographer who died in 2005. Recently, his daughter, Sonia King, was sorting through his possessions when she stumbled upon a red box labeled "November/December 1963." She found the Kennedy pics right away. King, who is now a mosaic artist living in Dallas, was just 10-years-old when JFK was shot, but she remembers the day quite well. My entire family was enamored of the Kennedys. Although my father's job required him to travel constantly, my dad arranged to be in town the day he heard Kennedy was coming to Dallas because he wanted to take pictures. He knew Dallas really well, and he knew where to go to get close to the motorcade. Because he was a manufacturer's rep, he had a showroom at the Dallas Trade Mart, where Kennedy was scheduled to speak. He had it all figured out: he would take pictures of the Kennedys as they drove near Turtle Creek...and then take the back streets to the Trade Mart to photograph the president and First Lady. The cars passed him and he photographed John and Jackie. In one photo, they're smiling right at him. But when he got near the Trade Mart, all he photographed was the motorcade racing to Parkland Hospital. He never really showed those photos to anybody, and I think he may have deliberately destroyed them — my father's carefully numbered slides were missing the sequence immediately after the photos you see above. That said, King says "my dad would be happy to see them in TIME Magazine, his favorite news publication."